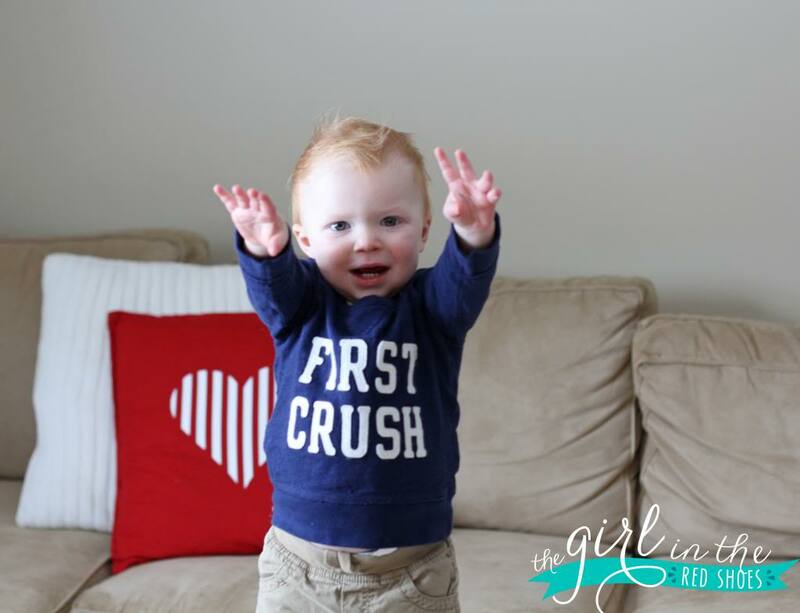 This Valentine’s day Hudson got lots of fun valentines from our blog friends! 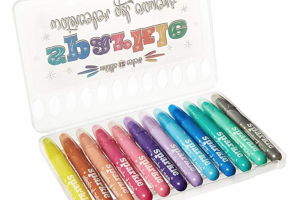 We had so much fun with our Secret Santa exchange that our little blogger group decided to do another fun swap just for Valentine’s day! We had a blast getting little surprises in the mail! 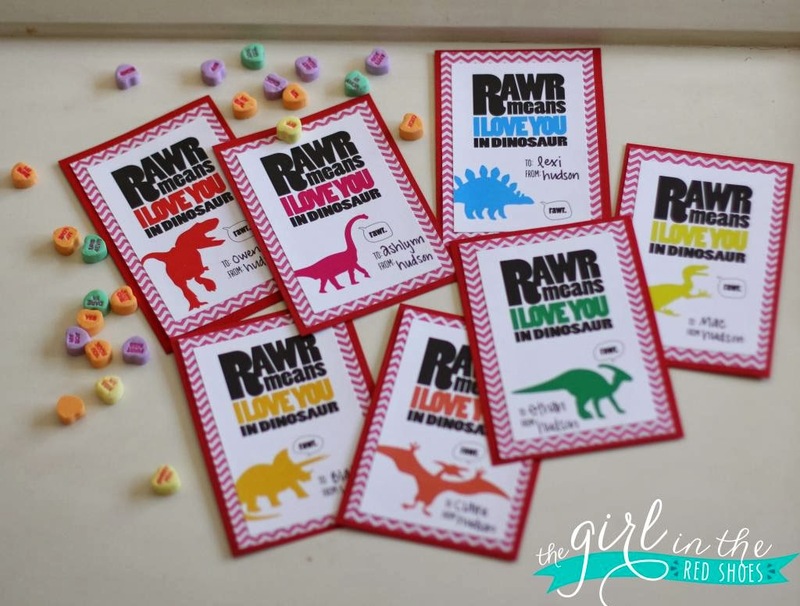 Hudson sent out these dinosaur valentines along with dinosaur stickers. We are dinosaur obsessed around here! 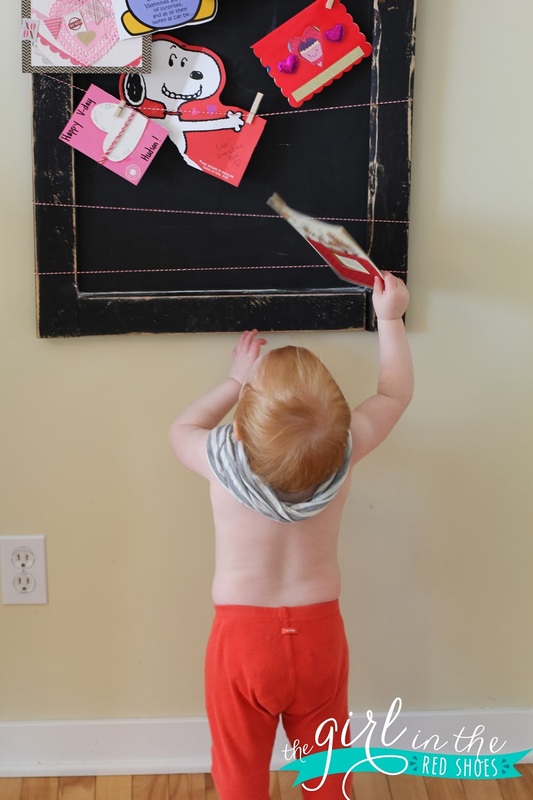 Each time we would receive a new valentine we would put them up on our trusty chalkboard…(plus a few extra cards from grandparents!) Everyone was so creative! Hudson LOVES cards of any kind…so he loved this display and loved playing with all of these adorable valentines! And yes, we are in a no-clothes stage. But he will wear a scarf? 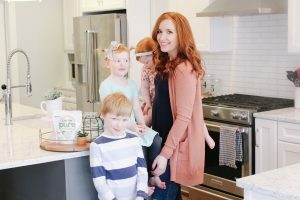 As a part of the exchange we also were paired up with one blogger to send the mom a sweet surprise…I sent Natasha from Hello Happiness some goodies and got the cutest little Valentine’s Day tea towel from Colleen from Meet the Sullivans! We had so much fun swapping valentines with everyone! Check out the blogs below to see everyone who participated! 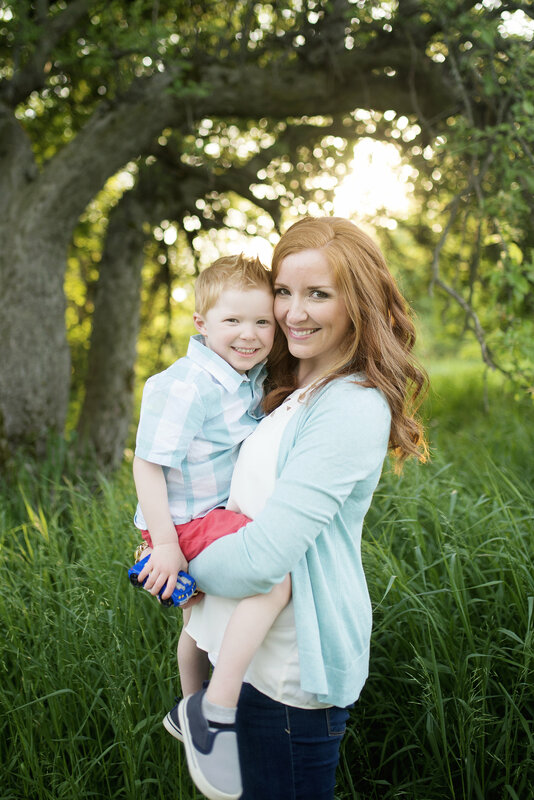 In other news, today I also want to introduce you to Marie, one of my sponsors this month! 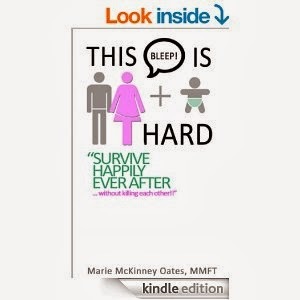 She has written an amazing ebook called This Bleep is Hard. Read on for details and a chance to win a copy of your own! I’m Marie McKinney Oates and I’m an author and marriage coach with Nashville Marriage Studio. 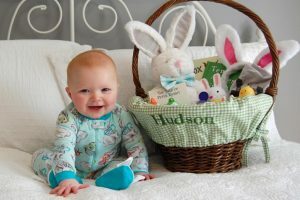 After having our son in 2011, my husband and I realized how much parenthood changed our marriage. We were no longer the same people with the same priorities as we were before we brought our beautiful boy home. It wasn’t long before we felt more like roommates than sweethearts, and that this marriage thing was, for the first time, hard. Thanks for reading, and I hope you check out This Bleep is Hard! 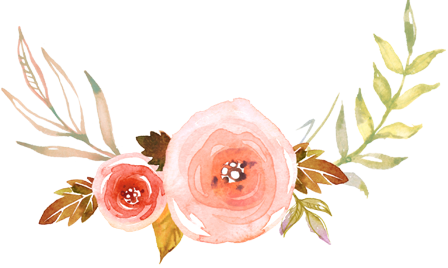 Marie is generously giving away 5 copies of her book to you guys! Enter below! Yay! Loved swapping Dino cards with you kids! And Hudson in his no clothes phase- totally cute- and totally a boy! Intimacy & keeping an organized house! I love those cards!! This swap was such a cute idea! This exchange was so much fun! 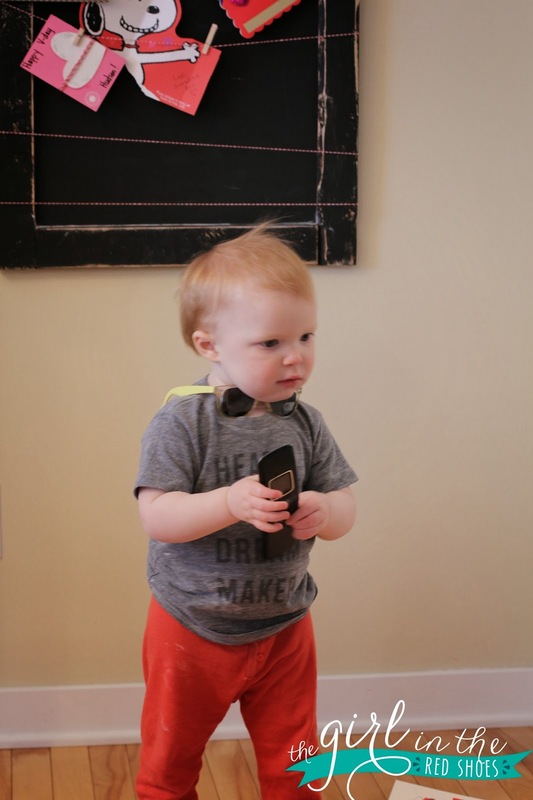 We loved getting your card in the mail — Owen is really into dinosaurs these days, so he loved the stickers. So glad you like the tea towel. 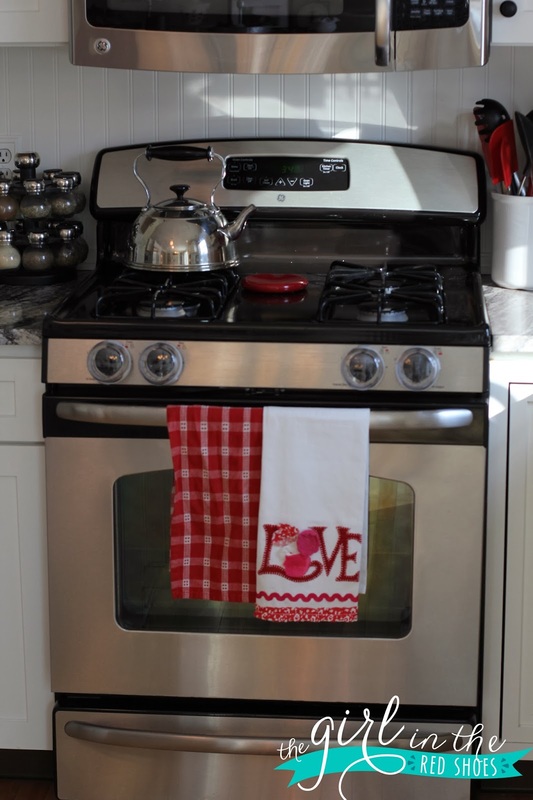 It looks cute on your oven! Would love to read this book, one of the hardest things has been working to learn more patience. Both my husband and I have to constantly work on this! What a fun Valentine idea. I love your creative dinosaur idea. And I agree totally. This bleep is hard! We loved your dino cards and the stickers were such a hit! I think one of the dogs is wearing a sticker right now! 🙂 Great exchange! Haha, a no-clothes phase sounds hilarious. I'm sure it's not when you're trying to get out the door! Fun Valentine swap, what a great idea. My biggest challenge since having a baby has been surviving on little sleep. Fortunately, Hudson is so cute, he can get away with the 'no clothes plus a scarf' trend:) Glad you guys had a good V-day! Biggest challenge is staying updated on Ellen…haha…I think I have 50 episodes on my DVR to watch. I never have time for TV anymore which is a good problem to have, I guess! My biggest challenge has been finding time for me amongst getting everyone else taken care, work, household chores, etc. 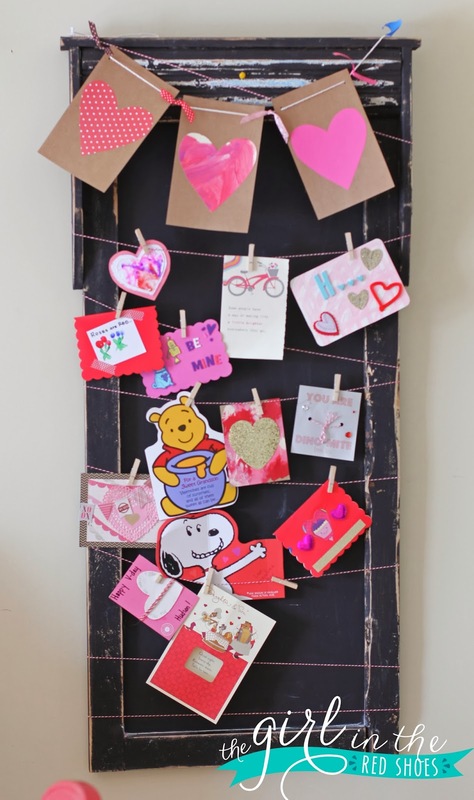 Such a cute idea to do a valentines exchange! I love it. And the hardest part about marriage after baby is definitely time. Once it's finally just me and my husband, we are both so tired after working all day that we just want to eat dinner, sit on the couch and fall asleep! I hear just pants and a scarf is very 'in' right now! All those valentines are so cute!! How fun to exchange with all the bloggers!! How does one join this group? Looks like a great book to add to my collection, since I'm getting ready to have my first baby! Love all of the Valentines you guys came up with! The hardest part of marriage after baby for us has been simply having the time/energy left for one another after a long day of work and parenting! 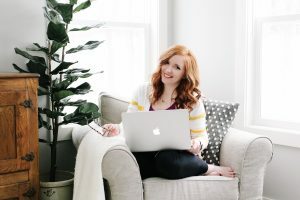 Biggest challenge – finding enough time to get everything done. Def getting back in shape and having a schedule for my son. Both of those are a huge struggle. Thanks for the giveaway! We are expecting our first in August so not quite sure what will be the hardest yet! !